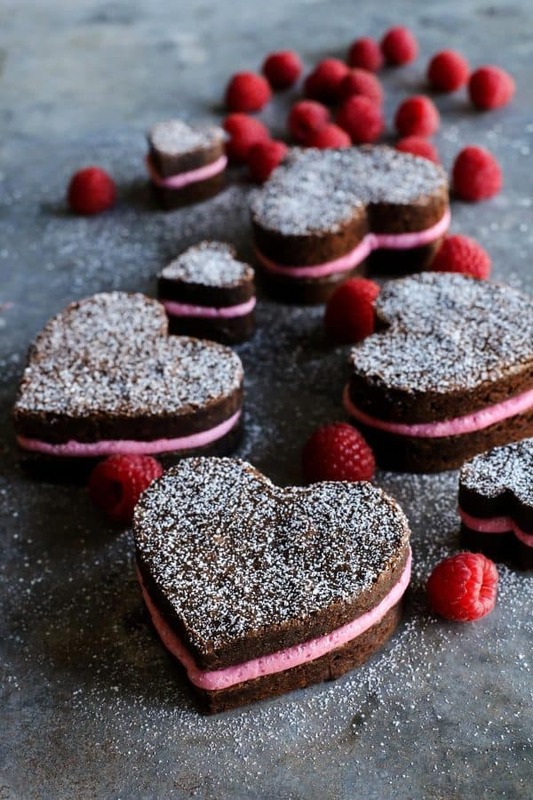 Heart Shaped Brownies with Fresh Raspberry Buttercream are the perfect Valentine (or any time!) brownies. 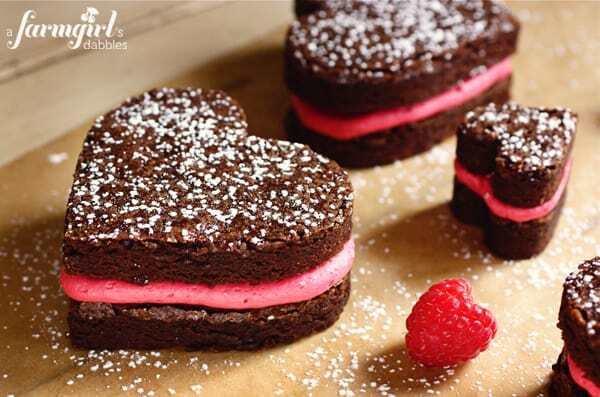 Fudgy, decadent brownies sandwich a creamy homemade buttercream flavored with real raspberries. I’m in love! 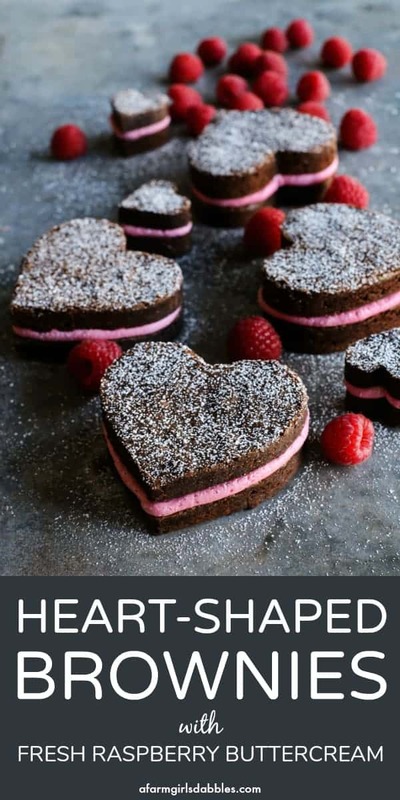 Every time I make these Heart Shaped Brownies with Fresh Raspberry Buttercream, our girls go crazy. But really, what’s not to love? Fudgy, decadent brownies sandwich a sweet and creamy homemade buttercream frosting flavored with real raspberries. It’s a match made in heaven, the perfect Valentine brownies! If I had to choose just one dessert as my favorite, it would have to be a fudgy, chewy brownie. And when you throw in some berries…well, I’m a goner. I like to make these brownies because I know how much our daughters adore them. But it’s true. I like them, too! 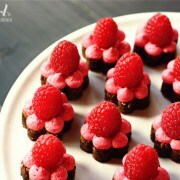 The fresh raspberry buttercream tips these heart brownies over the top when it comes to special Valentine’s Day treats. 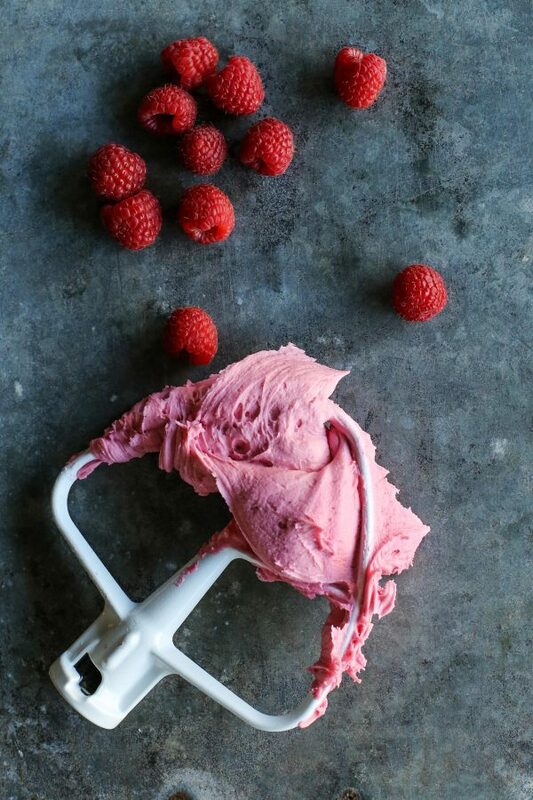 The frosting is bright and tangy, full of real raspberry flavor. And the vibrant pink color is compliments of the beautiful red raspberry alone. No artificial color is added. I use cookie cutters to create the heart shaped brownies. With this recipe, I can make six larger brownie sandwiches, plus a number of smaller ones. Sometimes I choose to make a whole pan of smaller heart sandwiches, a nice size for a smaller piece of dessert. 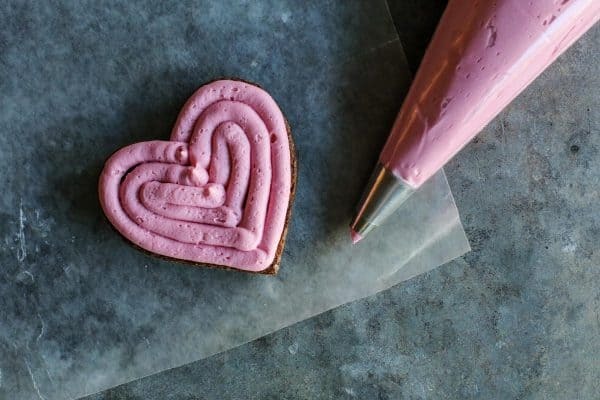 After the brownies are cut out, I pipe the raspberry buttercream (with this piping tip) over one heart and gently press a second heart over the top. Then I give the tops of the chocolate brownie hearts a little dusting of powdered sugar with a powdered sugar shaker. This not only adds pretty detail, but also helps to hide any imperfections made when cutting the brownies. If you’re looking for a fun and super flavorful dessert for Valentine’s Day, give these brownies a try. They’re visually impressive, yet comforting like only a brownie knows how to be. Just ask the girls in this house. We’re in love. 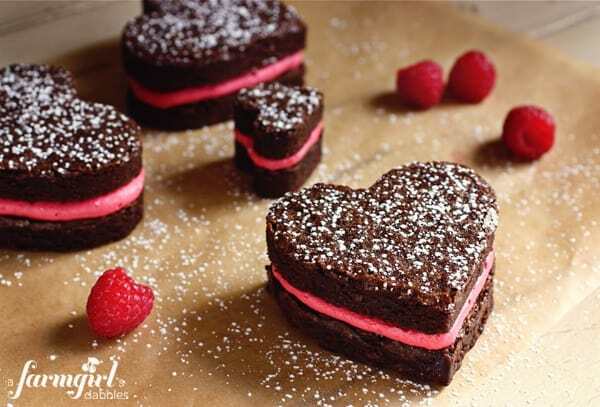 Like this Valentine brownies recipe? Pin it! Looking for more Valentine’s Day treats? These Yeast Donuts with Fresh Raspberry Glaze are lovely. Chocolate Mousse Cups are always a hit. 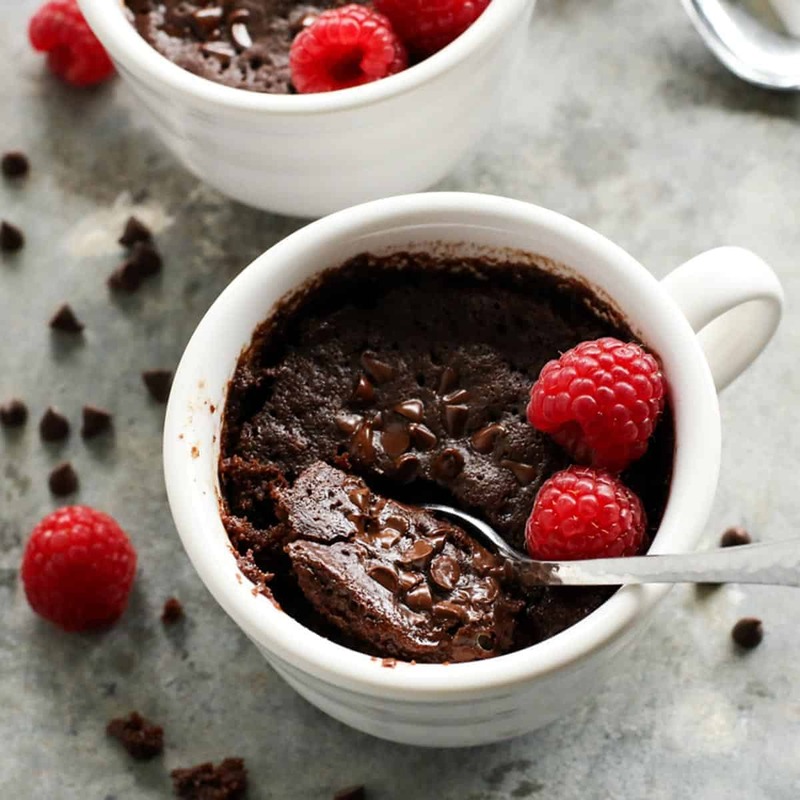 And this recipe for Gooey Chocolate Mug Cake for Two is quick and easy, and so very good! And here are a few treats I’d love to try! Red Velvet Cherry Dream Bars from 365 Days of Baking & More look so very fun. And this Chocolate Raspberry Bundt Cake from TidyMom has my name written all over it! 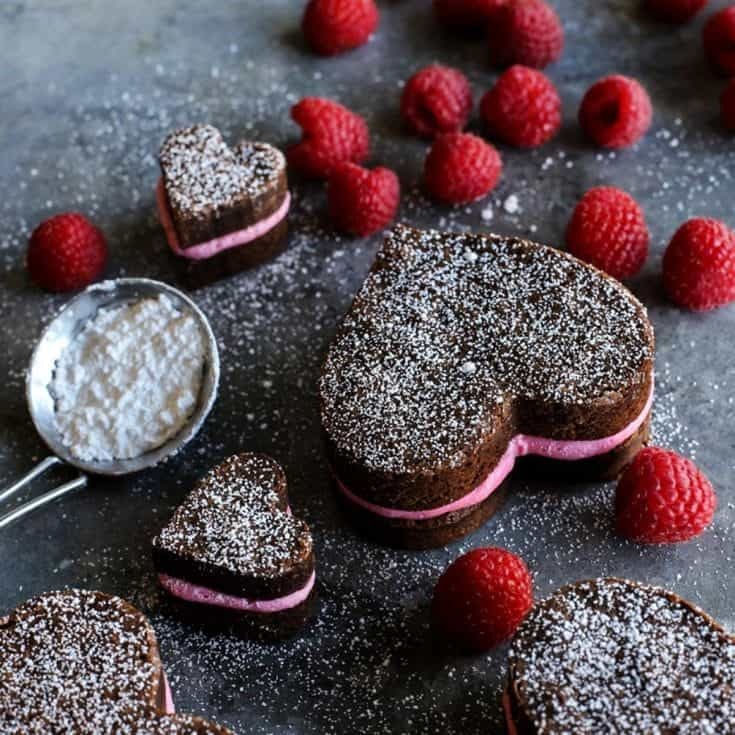 Fudgy, decadent brownies sandwich a creamy homemade buttercream flavored with real raspberries, the perfect Valentine (or any time!) brownies! for the brownies: Preheat oven to 325° F. Fold a long piece of heavy foil into a 13" wide strip and fit it inside a 9" x 13" metal baking pan, leaving foil overhang on the 2 long sides. Spray the foil lightly with nonstick spray. Set pan aside. In a large heavy saucepan over very low heat, stir butter and chocolate until everything is melted. Remove from heat and whisk in the sugar, and then the eggs, one at a time. Whisk in espresso powder, vanilla, and salt. Then sift the flour over the chocolate mixture and stir to blend well. Transfer batter to prepared pan. for the fresh raspberry buttercream: In a medium saucepan over medium heat, cook the raspberries, stirring frequently, until the raspberries are broken down into a very loose sauce. Line a fine mesh strainer with a double layer of cheesecloth, and then pour the raspberry sauce through to remove the seeds. 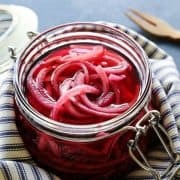 To get all the raspberry juice possible, twist up the ends of the cheesecloth very tightly and press on the raspberry sauce with the back side of a large wooden spoon to extract the juice. Then pour the raspberry juice back in the pot. Simmer until the juice reduces to 1/4 cup. The juice will be very concentrated, deep red in color. Set aside to cool. With a stand mixer, cream the butter with a paddle attachment on medium high speed about 2 minutes, until butter is lightened in color and a bit fluffy. Add 2 cups of powdered sugar, the 1/4 cup of cooled raspberry sauce, lemon juice, and salt. Mix until smooth. Add another 1-1/2 cups of powdered sugar and mix until smooth. Fit a pastry bag with a medium-large round tip (I use a this tip) and fill with fresh raspberry buttercream. With the pastry bag filled with fresh raspberry buttercream, pipe a line of frosting around the inside edge of one of the brownie hearts. Then fill in the inside of the line with frosting, too. Top with another brownie heart, gently pressing down to make a sandwich. Repeat until all your brownie hearts are completed. 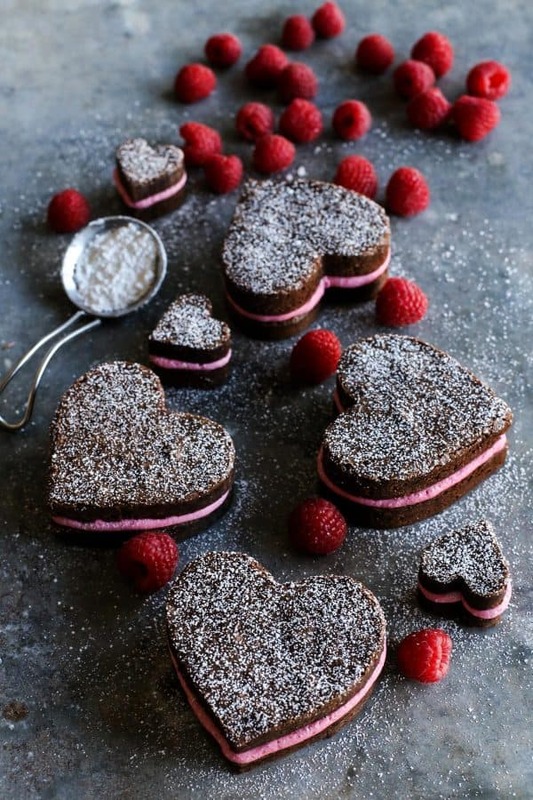 To finish, sprinkle the brownie hearts with powdered sugar. I like to fill a powdered sugar shaker with powdered sugar and gently tap the side to let the powdered sugar rain down. With the heart-shaped cookie cutters I use, I can make six large brownie heart sandwiches, plus several smaller ones. Or I can make about 20 of the smaller brownie heart sandwiches. This post was previously published in 2012. Some of the photographs and some of the text were updated in 2019. I think the baking time on the brownies is off. The top of the recipe says bake time 45 mins but in the recipe it says 20 mins which seems too short a time. Is 45 mins correct? Thanks! Hello Lisa – “cook time” includes both the brownies in the oven and the raspberry sauce on the stovetop. I hope you liked this recipe! 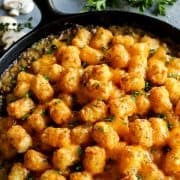 I am looking forward to making this recipe this weekend!! Is no liquid initially added to the saucepan with the raspberries? Can you tell me approx how long to cook the raspberries for? That is correct, no liquid. The raspberries will break down and give off their own juices. Cook raspberries, breaking them up periodically, until the raspberries are completely broken down and very liquid. This will take at least 10 minutes. Enjoy the brownies!! I’m gonna make these for my boyfriend for Valentine’s day. But I was wondering how long do they stay good? I want to possibly make them the day before Valentine’s day, if I put them in a container will they still be good the next day? Absolutely, they’ll still be great made a day beforehand. I would just caution to keep them at a cooler temperature if possible (not sitting under hot undercabinet lights, for example!). Enjoy! Hi Brenda! 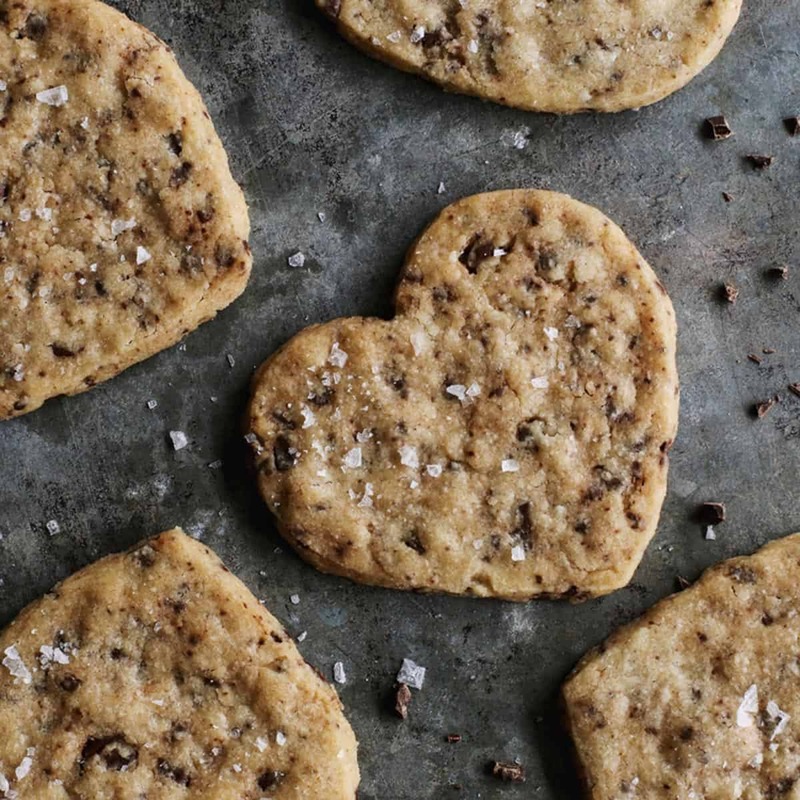 I’m in the middle of making your recipe and I doubled it so I can make some hearts for Galentine’s Day (tomorrow) and Valentine’s Day (in two days). Will the left over brownie batter be okay to seal and refrigerate and then bake for the Valentine’s Day batch?! I sure hope so! These brownies have been on my list of things to make for a while now, but I finally got around to it today. In a word, yum. I love the fresh raspberry buttercream. It has a wonderful tanginess that makes the icing not overwhelming. The brownies are also delicious and could easily standalone without the lovely pairing of the raspberry buttercream. Overall, great recipe! I’m so glad you liked these! These brownies are a favorite of our daughters’. I just made these brownies, I thought I had lemon juice but did not, so made them without. They taste good, what is the lemon juice for? These are so good. Easy too. I think the longer the frosting sits, the stronger the raspberry flavor gets. These are yummy. 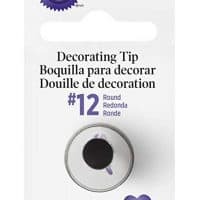 Pingback: Last-minute Valentine's gifts: Tons of ideas! Pingback: 5 ways to turn brownies into an easy Valentine's Day dessert. Okay…. I need to say…. those are some great brownies. Every time I make them, I have to make a double recipe, and every time I take it to work people LOVE IT! Made these today, and the brownies are delicious, but my buttercream curdled :( I’ll try again someday! Thank you for this recipe! We have a cake sale on Friday and will be baking some of these to take in and sell… the children will love them. Brownies look so yummy! Thanks for the recipe, Brenda! Wondering if I can substitute the instant espresso powder for regular instant coffee maybe? Don’t drink espresso so I don’t have instant espresso powder! Thank you! 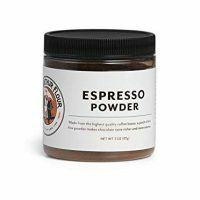 Do I have to use espresso powder? I don’t like coffee. Would it be okay to just leave it out? Hi Emily. You can surely omit the espresso powder. But I think you should try it – this ingredient really helps to deepen the chocolate flavor. Try using a smaller amount at first, if you like. I have been wanting to make these for a long time and when I finally did I ran into one problem after annother. For one the fresh raspberries that I simmered for over half an hour on medium heat just ended up being a thick, unstrainable paste. 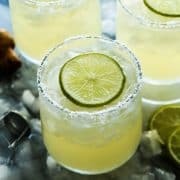 This recipe doesent Aucall for any water or sugar. But out of desperation I ended up adding 1/4 cup of water and it FINALLY strained. When I added it to the creamed butter and sugar it died it pink but it tasted like gross butter and sugar paste. I was eventually able to doctor it up with some raspberry jam but this recipe was definately missing crucial ingredients like water for instance. I don’t think I will make this again and i was surprised how long it took me to make just the sauce, not to mention the brownies. 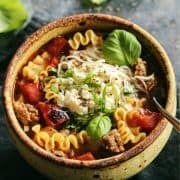 I’m from Turkey and I have a website about food recipes. 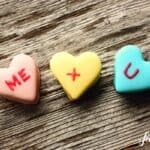 A few days ago I was searching for a valentines day recipe and found your web site from google search. 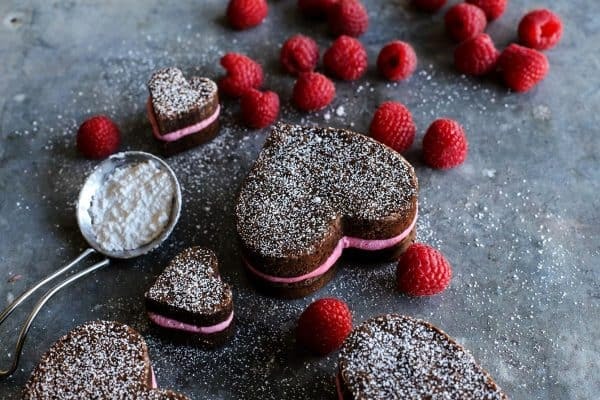 I saw the Fudgy Brownie Hearts with Raspberry Butter Cream recipe. I baked it and put both on my website and instagram. Thanks for the recipe. They taste as great as they look. Wonderful!! Thank you so much for coming back to let me know! What if i dont have fresh or frozenstrawberry or raspberry. ?can i use strawberry syrup or crush.? Hi, these look wonderful! Do the raspberries need to be thawed prior to using? Thank you, Sara! No need to thaw the raspberries. These look amazing! I have heard that espresso powder really enhances the chocolate flavor, but I wasn’t able to find it locally. Will they still be chocolatey if I leave it out? Thanks! Hi Ashley! Yes, they will still be chocolatey. The espresso just deepens the flavor. I am adding it to more and more of my chocolate baked goods all the time! I just found your blog tonight after finding you on Google + in the food bloggers group I’m in. I am already pinning away! These look AMAZING! I think I’d be right there with you saying mmm with these. I’m going to make these soon, converting to gluten-free. Thanks for sharing! I just made a double batch of these treats and they are absolutely fabulous! 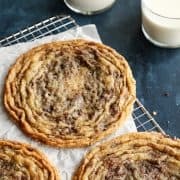 I used a high quality chocolate and found the perfect cookie cutter (thanks for mentioning the height–that saved me). These will be a Valentine tradition in my family. Just a question: you called for 3 1/2 cups of powdered sugar, but in the instructions you only say to mix in 2 1/2 cups. Typo? Love this! I’m the process of making a batch myself for my sweetheart :) a few tweaks…and peanutbutter buttercream in place of the raspberry – he’s going to love it ! Thanks for posting ! Wonderful to hear that, Caitlin! Hope you liked them! Hi I tried this recipe today because it looked so good and I loved it for Valentine but it didnt work with me :-( I left the brownies about 20 Min. in the oven even little bit more but when I tried to cut them they were sticking on the foil and the batter was not baked still raw. What happend? also when I tried cutting them with the cookie cutter the crust broke and it looked ugly. ‘Please help me !!! I’m sorry to hear you had troubles, Laura. I’ve made these a couple times, plus I’ve heard from friends who have made them, and I’ve seen other bloggers make and feature this recipe on their own sites – you’re the first I’ve heard that the brownies didn’t work. I would double-check your ingredients and quantities. Did you spray your foil? Did you use unsweetened chocolate, per the recipe? I did try making these with sweetened chocolate in my trial baking and they did not cut as cleanly. 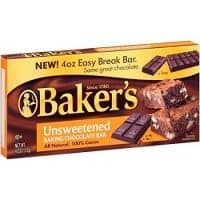 But even with the unsweetened chocolate, they are not going to cut 100% perfectly. There will be a little bit of breakage, but it’s pretty minimal. That’s what the powdered sugar sprinkle is for, to make them look all pretty AND to hide any of that cutting imperfection! Best wishes with your next batch, please let me know how it goes. Wow! These look delicious! I will definitely make these. Cheers! Thanks, Heather! I know a couple friends who were making this today, to surprise their family with tomorrow on Valentine’s Day. What a treat! Came across these on Pinterest, and thought they looked amazing! So I picked up the things I needed at the store today and gave it a shot. Ohmydang they are to die for! They disappeared in minutes! Thank you for this amazing recipe! Can I use cherry instead of raspberry and is the buttercream very sweet considering the amount of shugar? Hello! Although I have not made this with cherries, I would surely not be afraid to try it…sounds delicious! Just be sure to cook it down until it’s syrupy and just 1/4 cup. The buttercream is quite sweet, with a very bright fruity tanginess. Best wishes! I tried making this about a week ago but the buttercream ended up so runny! I followed the recipe correctly, I don’t understand why this happened! I would love to try again though, such a yummy idea!! I’m sorry to hear that, Nicole. I thought it was just the perfect consistency – nice and light and whippy. Did you reduce the raspberry to just 1/4 cup, so it was rather thickened and super concentrated? I don’t know what else to tell you, other than to just make sure the correct quantities are used next time. Best wishes!! This is absolutely ADORABLE!! 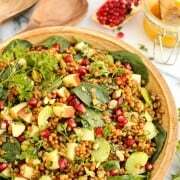 I’m putting together a section of recipes for LOVE month on my site … http://www.wikimommy.com … and I would love to feature this!! Please email me ro (at) wikimommy (dot) com and let me know if I may re-post this on my site. Thanks for sharing!! Wow!! I just found my heart cookie cutter today in the back of my cooking tools drawer. I am so going to use it to make these yummy looking treats. Yay! Please let me know what you think! These look awesome! Your photos are great also. Does this buttercream require refridgeration after it is made or will it stay good if it sits out? I guess my worry is whether or not the fruit will spoil? My batch didn’t last more than a day around here. If you think you’ll have yours around for longer than that, I would definitely refrigerate them. Thanks, Amber! Thank you so much. We’ll definitely be making these again! Question; If I make them tonight and fill them with Raspberry buttercream, will they be to wet or moist tomorrow ? Hello Osvald! They will be just fine to make the day before. But I wouldn’t make them any sooner than that. Hope you like them! Yum! Im making these tomorrow for a friends birthday! Thanks! Thank you so much, Avril! Theses looks so sweet and sound delicious, especially the Raspberry Buttercream! Yum! I tried these brownies and the frosting today. They were SOO good. I couldn’t stop eating them! I think they are one of the best brownies I have ever had! these look SO good! I wonder if I can successful adapt to be gluten-free… always in for a good challenge! Yum! LOVE the photo with the little heart shaped raspberry. Thank you! We devoured these, so good! Just wanted to stop by and tell you I featured these today over at The Crafted Sparrow. :) They look yummy. So not fair – I just got back in from a run and am STARVING. These would taste so good right now! Those are beautiful, and I love the little mini heart ones too. I want these for Valentine’s Day!! Looks SO good! I would LOVE to make this for my dad’s birthday which is on Valentine’s Day. I’m thinking strawberries instead of raspberry ;o) Thanks for posting this! I went back and forth between strawberry and raspberry – I know the strawberry will be excellent, too! OMG…your site looks amazing!! Love the updates and these brownies FABULOUS!! My mouth is watering just looking at these. The combination of raspberry and chocolate would be delicious. I just might have to whip up a batch for Valentine’s day myself. These look seriously delicious. I love using cookie cutters on brownies, because I can snack on the leftovers as I go! Mmmm they look amazing! I finish my exams on Friday so I’ll make these at the weekend! My housemates love brownies and I love making them so its brilliant! What an excellent way to celebrate finishing up with exams! Hope you like them!! These are so cute and sound amazing Brenda!! I’m fairly certain I’d be moaning up a storm also…which could be embarrassing. But I’m fairly certain that anyone who tasted these would do the same. And then they’d understand and forgive me. I really need a good dose of that frosting! these looks beautiful, getting ready for valentines! mmmmmmmm, I think I’ll try to bake it! Looks delicious! Wow, these are gorgeous, and chocolate and raspberry are one of my favorite combos. What a great idea – loving your blog! Lovely to hear from you – thanks!! They look very yummy! AND very pretty! Aww these are so cute and perfect for Valentine Day. The brownies look like there’d be good on their own too. The brownies are EXCELLENT on their own. Definitely. Nice to hear from you, Becca! These are adorable, I’m in love with them, pinned! These sound so yummy! And I especially love those cute little hearts! Almost to pretty to eat! Beautiful. If these aren’t the prettiest brownies I’ve ever seen I don’t know what is! That raspberry buttercream looks to die for too! Thank you, Paula – wishing an awesome week for you! Thank you so much, Katrina! Have a great week! these are gorgeous! cannot wait to make a batch myself. Chocolate and raspberry?!?!? Count me in! And they are, Laurie! Our girls LOVED them! Thank you so much – great to hear from you again! Thank you so much, great to hear from you again!